HD Radio is a trademarked term for Xperi's in-band on-channel (IBOC) digital radio technology used by AM and FM radio stations to transmit audio and data by using a digital signal embedded "on-frequency" immediately above and below a station's standard analog signal, providing the means to listen to the same program in either HD (digital radio with less noise) or as a standard broadcast (analog radio with standard sound quality). The HD format also provides the means for a single radio station to simultaneously broadcast one or more different programs in addition to the program being transmitted on the radio station's analog channel. It was originally developed by iBiquity. In September 2015 iBiquity was acquired by DTS bringing the HD Radio technology under the same banner as DTS' eponymous theater surround sound systems.. It was later acquired by Xperi in 2016. It was selected by the U.S. Federal Communications Commission (FCC) in 2002 as a digital audio broadcasting method for the United States, and is the only digital system approved by the FCC for digital AM/FM broadcasts in the United States. It is officially known as NRSC-5, with the latest version being NRSC-5-D. Other digital radio systems include FMeXtra, Digital Audio Broadcasting (DAB) (Eureka 147), Digital Radio Mondiale (DRM30 and DRM+ configurations), and Compatible AM-Digital (CAM-D). While HD Radio does allow for an all-digital mode, this system currently is used by some AM and FM radio stations to simulcast both digital and analog audio within the same channel (a hybridized digital-analog signal) as well as to add new FM channels and text information. Although HD Radio broadcasting's content is currently free-to-air, listeners must purchase new receivers in order to receive the digital portion of the signal. By May 2018, HD Radio technology was claimed to be used by more than 3500 individual services, mostly in the United States. This compares with more than 2200 services operating with the DAB system. HD Radio increases the bandwidth required in the FM band to 400 kHz for the analog/digital hybrid version. This makes adoption outside the United States problematic. In the United States the FM broadcast band channels have a spacing of 200 kHz, as opposed to the 100 kHz that is normal elsewhere. The 200 kHz spacing means that in practice, stations having concurrent or adjacent coverage areas will not be spaced at less than 400 kHz in order to respect protection ratios which would not be met with 200 kHz spacing. This also leaves space for the digital sidebands. Outside the US, spacing can be 300 kHz, which causes problems with the digital sidebands. If the primary digital signal (HD-1) is lost the HD Radio receiver will revert to the analog signal, thereby providing seamless operation between the newer and older transmission methods. The extra HD-2 and HD-3 streams are not simulcast on analog, causing the sound to drop-out or "skip" when digital reception degrades (similar to digital television drop-outs). Alternatively the HD Radio signal can revert to a more-robust 20 kilobit per second stream, though the sound is reduced to AM-like quality. Datacasting is also possible, with metadata providing song titles or artist information. The FM hybrid digital/analog mode offers four options which can carry approximately 100, 112, 125, or 150 kbit/s of data carrying (lossy) compressed digital audio depending upon the station manager's power budget and desired range of signal. The HD Radio also provides several pure digital modes with up to 300 kbit/s bitrate, and enabling extra features like surround sound. Like AM, pure digital FM provides a "fallback" condition where it reverts to a more robust 25 kbit/s signal. Where the digital signal fails, the analog signal is used as a fallback for the main digital channel (normally HD1), requiring synchronization of the two. This requires a significant delay being added to the analog service. Current FCC rules require that one channel be a simulcast of the analog signal. In some cases, particularly during tropospheric ducting events, an HD Radio receiver will lock on to the digital sidebands of a distant station, even though there is a much stronger local analog-only station on the same frequency. With no automatic identification of the station on the analog signal, there is no way for the receiver to recognize that there is no correlation between the two. (Station identification is sent by voice, or as RBDS data, but not all stations use RBDS.) The listener can possibly turn HD reception off (to listen to the local station, or avoid random flipping between the two stations), or listen to the distant stations and try to get a station ID. Since 2016, newer HD radios support Bluetooth and EAS alerts in which the transmission of traffic, weather, AMBER and security alerts can be displayed on the radio. As with Artist Experience, emergency alerts are displayed at the station's discretion and requires extra equipment. FM stations typically require up to 280 kilohertz of spectrum when carrying a stereo transmission. The bandwidth of a FM carrier is found by doubling the sum of the peak deviation (usually 75 kHz) and the highest baseband modulating frequency (around 60 kHz when RBDS is used). Only 15 kHz of the baseband bandwidth is used by analog monaural audio (baseband), with the remainder used for stereo, RBDS, paging, radio reading service, rental to other customers, or as a transmitter/studio link for in-house telemetry. In regular hybrid mode a station has ±100 kHz of analog bandwidth and adds an extra ±30 kHz guard band and ±70 kHz for its digital signals, thus taking a full 400 kHz of width. FM stations also have the option to discontinue existing subcarrier services (usually at 92 kHz and 67 kHz) in order to carry extended HD Radio, though such services can be restored through use of the digital subchannels that are then made available. However, this requires the replacement of all related equipment both for the broadcasters and all of the receivers that use the discontinued services. The ratio of power of the analog signal to the digital signal was initially standardized at 100:1 (-20 dBc), making the digital signal 1% of the analog carrier power. Unlike with subcarriers, where the total baseband modulation is reduced, there is no reduction to the analog carrier power. The National Association of Broadcasters (NAB) requested a 10 dB (10×) increase in the digital signal from the FCC. This equates to an increase to 10% of the analog carrier power, but no decrease in the analog signal. This was shown to reduce analog coverage because of interference, but results in a dramatic improvement in digital coverage. Other levels were also tested, including a 6 dB or fourfold increase to 4% (−14dBc or 25:1). National Public Radio was opposed to any increase because it is likely to increase interference to their member stations, particularly to their broadcast translators, which are secondary and therefore left unprotected from such interference. Other broadcasters are also opposed (or indifferent), as increasing power would require expensive changes in equipment for many, and the already-expensive system has so far given them no benefit. On January 29, 2010, the U.S. FCC approved a report and order to voluntarily increase the maximum digital effective radiated power (ERP) to 4% of analog ERP (−14 dBc), up from the previous maximum of 1% (−20dBc). Individual stations may apply for up to 10% (−10dBc) if they can prove it will not cause harmful interference to any other station. 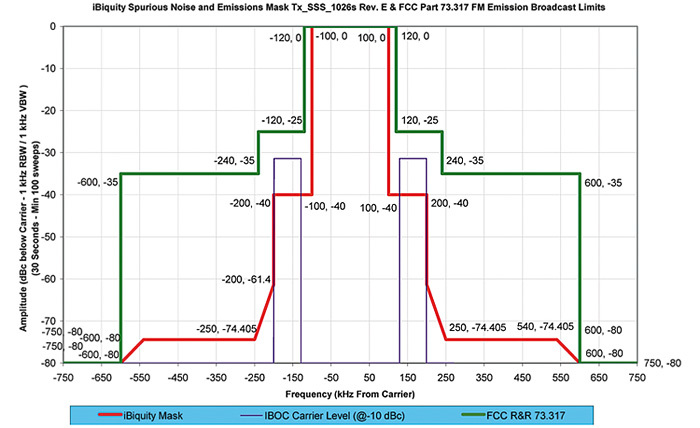 If at least six verified complaints of ongoing RF interference to another station come from locations within the other station's service contour, the interfering station will be required to reduce to the next level down of 4%, 2% (−17 dB), or 1%, until the FCC makes a final determination. The station to which the interference is caused bears the burden of proof and its associated expenses, rather than the station that causes the problem. For grandfathered FM stations which are allowed to remain over the limit for their class, these numbers are relative to that lower limit rather than their actual power. Some countries have implemented Eureka-147 Digital Audio Broadcasting (DAB) or its successor DAB+. DAB broadcasts a single station that is approximately 1500 kilohertz wide (~1000 kilobits per second). That station is then subdivided into multiple digital streams of between 9 and 12 programs. In contrast FM HD Radio which requires 400 kHz bandwidth is assigned to the traditional 200 kilohertz channel spacing used in the United States, with capability of 300 kbit/s in pure digital mode. The first generation DAB uses the MPEG-1 Audio Layer II (MP2) audio codec which has less efficient compression than newer codecs. The typical bitrate for DAB stereo programs is 128 kbit/s or less and as a result most radio stations on DAB have a lower sound quality than FM does under similar conditions. Many DAB stations also broadcast in mono. In contrast, DAB+ uses the newer AAC+ codec and FM HD Radio uses a codec based upon the MPEG-4 HE-AAC standard. HD Radio does not use ATSC, the standard for digital television in the United States. In the days of analog television, the low end of the FM broadcast band (87.7 to 87.9 MHz) overlapped with the audio subcarrier of analog television's channel 6 (which occupied the upper end of the VHF-TV low band); because the NTSC analog-television standard used ordinary analog FM to modulate the audio subcarrier, the audio of television stations that broadcast on channel 6 could be heard on most FM radios. In earlier days of television and radio, several television stations exploited this overlap and operated as radio stations (a process that still continues with some low-powered stations, which are still allowed to broadcast in analog for the time being). Full-powered television stations were forced to cease analog broadcasting in June 2009, with low-powered stations scheduled to cease analog broadcasting by September 2015. Because the digital television and digital radio standards are incompatible with each other, HD radios are not able to receive digital TV signals on the 87.7 MHz frequency, eliminating the former dual-medium compatibility of channel 6 television stations. The costs of installing the system, including fees, vary from station to station, according to the station's size and existing infrastructure. Typical costs are at least several tens of thousands of dollars at the outset (including transmitter, diplexer or antenna/feedline, and labor), plus per-channel annual fees (3% of the station's annual revenue) to be paid to iBiquity for HD-2 and HD-3 (HD-1 does not have any royalty charge). Large companies in larger media markets (such as iHeartRadio or Cumulus Broadcasting) can afford to implement the technology for their stations. However, community radio stations, both commercial and noncommercial, cannot. During mid-2010 a new generation of HD Radio broadcasting equipment was introduced greatly lowering the technical costs of implementing the system. iHeartRadio is selling programming of several different music genres to other competing stations, in addition to airing them on its own stations. Some stations are simulcasting their local AM or lower-power FM broadcasts on sister stations' HD2 or HD3 channels, such as KMBZ-FM in Kansas City simulcasting 610 KCSP's programming on 96.5-HD2. It is common practice to broadcast an older, discontinued format on HD2 channels; for example, with the recent disappearance of the smooth jazz format from the analog radio dial in many markets, stations such as WDZH in Detroit, Michigan (formerly WVMV), WFAN-FM in New York City, and WNWV in Cleveland, Ohio program smooth jazz on their HD2 or HD3 bands. Some HD2 or HD3 stations are even simulcasting sister AM stations. In St. Louis, Missouri for example, clear-channel KMOX AM (1120 kHz analog and HD) is simulcast on KEZK FM 102.5 HD3. KBCO in Boulder, Colorado uses its HD2 channel to broadcast exclusive live recordings from their private recording studio. CBS Radio is implementing plans to introduce its more popular superstations into distant markets (KROQ-FM into New York City, WFAN into Florida, and KFRG and KSCF into Los Angeles) via HD2 and HD3 channels. On March 8, 2009, CBS Radio inaugurated the first station with an HD4 subchannel, WJFK-FM in Washington, DC, a sports radio station which also carries sister sports operations WJZ-FM from Baltimore; Philadelphia's WTEL and WIP; and WFAN from New York (though at some point, the WJZ-FM simulcast was replaced with a simulcast of Dallas, Texas sister sports station KRLD-FM). Since then numerous other channels have implemented HD4 subchannels as well, although with nearly 100% talk-based formats because of the reduced audio quality. For example, KKLQ in Los Angeles operates an HD4 signal and aired The Mormon Channel which was 99% talk. Southern California Public Radio, heard on 89.3 FM in Los Angeles, offers a digital simulcast of its analog channel on 89.3 HD1 and MPR's music service The Current on 89.3 HD2 in Los Angeles. Some commercial broadcasters also use their HD2's to broadcast the programming of noncommercial broadcasters. Bonneville International uses its HD2 and HD3 channels to broadcast Mormon Channel which is entirely noncommercial and operates solely as a public service from Bonneville's owner, The Church of Jesus Christ of Latter-day Saints. That network of eight HD2 and HD3 stations was launched on May 18, 2009 and was fully functional within two weeks. Also, in Detroit, WMXD, an urban adult contemporary station, airs the contemporary Christian K-Love format on its HD2 band (the HD2 also feeds several analog translators around the metropolitan area—see below), due to an agreement between iHeartMedia and K-Love owner Educational Media Foundation allowing EMF to program WMXD's HD2. On a similar note, Los Angeles' KRRL 92.3's HD3 signal rebroadcasts EMF's Air1 and in Santa Barbara KLSB 97.5, which airs K-Love on its primary frequency, rebroadcasts Air1 on HD2 though neither one support 'Artist Experience'. In July 2018, as part of a projected one year experiment, WWFD in Frederick, Maryland became the first AM station to eliminate its analog transmissions and broadcast exclusively in digital. Although broadcast translators are prohibited from originating their own programming, the FCC has controversially allowed translator stations to rebroadcast in standard analog FM the audio of an HD Radio channel of the primary station the translator is assigned to. This also allows station owners, who already usually own multiple stations locally and nationally, to avoid the rulemaking process of changing the table of allotments as would be needed to get a new separately-licensed station, and to avoid exceeding controlling-interest caps intended to prevent the excessive concentration of media ownership. Such new translator stations can block new LPFM stations from going on the air in the same footprint. Translator stations are allowed greater broadcast range (via less restrictive height and power limitations) than locally originated LPFMs, so they may occupy a footprint in which several LPFMs might have been licensed otherwise. The list of HD Radio automotive receiver manufacturers includes Alpine Electronics, Clarion, Delphi Corporation, Directed Electronics, Dual, Harman, Hirschmann Car Communication GmbH (now Part of TE Connectivity), Insignia, Jensen, JVC, Kenwood, Pioneer, Sony, and Visteon. Most car manufacturers offer HD Radio receivers as audio packages in new cars, including Ford, Honda, Hyundai, Kia, Mazda, Subaru, Tesla Motors, Toyota, Volkswagen and, Nissan. Home and office listening equipment is currently[when?] available from roughly a dozen companies, in both component tuner and tabletop models, including Audio Design Associates, Boston Acoustics (discontinued), DaySequerra, Denon, DICE Electronics, Directed Electronics, Insignia, Jensen Electronics, LG (discontinued), Marantz, McIntosh, Onkyo, Polk Audio, Radiosophy (discontinued), Radio Shack, Rotel, Sangean, Sony, TEAC, Visteon, and Yamaha. On July 12, 2009, Best Buy started selling a house brand portable unit, the Insignia NS-HD01, which was the second portable HD Radio to come to the general market and features FM-only playback and a non-removable rechargeable battery which charges via mini USB. Coby produced the first portable HD radio (HDR-700). The Insignia unit sold in 2009 for around $50, the least expensive receiver available, and continues to be sold as of february 2019. On September 15, 2009, Microsoft released the Zune HD, which includes an HD Radio receiver within the media device. The Zune HD is now discontinued. As of June 10, 2017, a project hosted on GitHub called nrsc5 has been created to allow HD Radio reception via rtl-sdr USB devices. ^ a b Dortch, Marlene H. (2002-10-11). Digital Audio Broadcasting Systems and Their Impact on the Terrestrial Radio Broadcast Service (PDF). Federal Communication Commission. Retrieved 2008-12-31. ^ Tucker, Ken (2007-03-22). "FCC approves HD Radio Rules". Mediaweek. Nielsen Business Media. Archived from the original on November 3, 2007. Retrieved 2008-12-31. ^ "Newest Releases". National Radio Systems Committee. Archived from the original on 2017-09-16. Retrieved 2017-10-28. ^ "BS.412 : Planning standards for terrestrial FM sound broadcasting at VHF" (PDF). ^ "Receiving NRSC-5". theori.io. Archived from the original on 20 August 2017. Retrieved 14 April 2018. ^ iBiquity Licensing Fact Sheet 2009 (PDF) Archived 2011-07-13 at the Wayback Machine. ^ "Terrestrial Digital Radio". Consumer Electronics Association. Archived from the original on 2009-01-08. Retrieved 2008-12-31. ^ "Becoming an HD Radio IP Licensee". iBiquity Digital Corporation. Archived from the original on 2008-12-31. Retrieved 2008-12-31. ^ "How does HD Digital Radio Sound?". 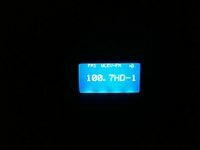 HD Digital Radio. Archived from the original on 2009-01-21. Retrieved 2008-12-31. ^ Zuk, Karl (2007-11-20). "Night of the Bees". Write or Karl me!. Blogspot. Archived from the original on 2011-07-08. Retrieved 2008-12-31. ^ MP3 sample of the interference: IBOC Observations Soundclip Archived 2009-03-25 at the Wayback Machine. ^ "Stations in Maryland broadcasting on HD Signals". iBiquity Digital Corporation. Archived from the original on 2011-07-13. Retrieved 2016-07-03. ^ Juan@HDRadio (24 July 2013). "Artist Experience®". hdradio.com. Archived from the original on 25 July 2016. Retrieved 14 April 2018. ^ Juan@HDRadio (28 October 2016). "Sparc HD Radio Receiver w/Bluetooth and Emergency Alerts". hdradio.com. Archived from the original on 14 April 2018. Retrieved 14 April 2018. ^ "NAB Will Ask FCC to Up FM IBOC Power". Radio World. NewBay Media. 2008-02-01. Archived from the original on 2008-08-04. Retrieved 2008-12-31. ^ Veriner, Doug (2006). IBOC Coverage and InterferenceIBOC Coverage and Interference (PDF). Archived from the original (PDF) on 2009-03-25. Retrieved 2008-12-31. ^ "HD Radio - Less choice more noise!". Worldsupercaster. Blogspot. 2005-08-16. Archived from the original on 2006-10-19. Retrieved 2008-12-31. ^ "Feature: Going Digital - The End of Radio As We Know It". DIY Media. 2002-01-03. Archived from the original on 2009-01-11. Retrieved 2008-12-31. ^ FCC (2010-01-29). "Digital power increase for FM stations approved. MM Docket No. 99-235, DA 10-208" (PDF). Archived from the original (PDF) on 2014-05-23. Retrieved 2010-02-26. ^ Holm, Steve (2007). "Lydkvalitetet i DAB digitalradio". Digitale Utgivelser ved UiO. Archived from the original on 2008-05-01. Retrieved 2009-01-03. (Norwegian). ^ "Mono is the new stereo on national DAB". digitalradiotech.co.uk. 2006-12-15. Retrieved 2009-01-03. ^ "HD Radio vs. Internet Radio: Which is Radio's Future?". Bridge Ratings. 2007-08-08. Archived from the original on 2008-12-16. Retrieved 2009-01-03. ^ Savage, Bob. "End The Radio Engineering Scourge That Could Mean Doom To AM Radio". Stop IBOC Now!. Archived from the original on 2011-09-04. Retrieved 2016-07-03. ^ Saghir, Ryan (2008-09-12). "HD Radio awareness is up... so what?". Orbitcast. Archived from the original on 2009-01-04. Retrieved 2009-01-03. ^ Menta, Richard (2007-03-24). "HD Radio Undermined by Weak Tuners". Archived from the original on 2008-12-28. Retrieved 2009-01-03. ^ "Neth FM". Archived from the original on 2011-07-14. ^ "Second Report & Order (U.S. FCC)" (PDF). 2007-05-31. Retrieved 2007-10-29. ^ Pizzi, Skip (2007-09-01). "Subscription Radio Gets Real". Radio World. Archived from the original on 2008-09-05. Retrieved 2009-01-03. ^ Behrens, Steve (2008-09-02). "More power for HD Radio, more buzz on analog". Current. Archived from the original on 2008-12-30. Retrieved 2009-01-03. ^ "Local HD Radio Stations". hdradio.com. Archived from the original on 28 November 2017. Retrieved 14 April 2018. ^ "HD Radio - Minnesota Public Radio". publicradio.org. Archived from the original on 7 October 2015. Retrieved 14 April 2018. ^ Radio, Southern California Public. "Listen". scpr.org. Archived from the original on 5 October 2017. Retrieved 14 April 2018. ^ "Hubbard Testing All-Digital AM on WWFD" by Emily M. Reigart, July 16, 2018 (radioworld.com). ^ Juan@HDRadio (9 July 2013). "Subaru". hdradio.com. Archived from the original on 14 April 2018. Retrieved 14 April 2018. ^ "DTS and Ibiquity Digital Corp to Make the Drive Better with HD Radio Technology - DTS". www.ibiquity.com. Archived from the original on 3 April 2015. Retrieved 14 April 2018. ^ "Intel acquired SiPort maker of Digital Radio Silicon". www.abiresearch.com. Retrieved 14 April 2018. ^ Murph, Darren (2009-07-12). "Insignia NS-HD01: first-ever portable HD Radio on sale at Best Buy". Engadget. Archived from the original on 2009-07-13. Retrieved 2009-07-12. ^ Topolsky, Joshua (2009-09-17). "Zune HD review by Engadget". Engadget. Archived from the original on 2009-09-22. Retrieved 2009-09-17. ^ "theori-io/nrsc5". GitHub. Archived from the original on 27 July 2017. Retrieved 14 April 2018. ^ "rtl-sdr.com - RTL-SDR (RTL2832U) and software defined radio news and projects. Also featuring Airspy, HackRF, FCD, SDRplay and more". rtl-sdr.com. Archived from the original on 13 April 2018. Retrieved 14 April 2018.